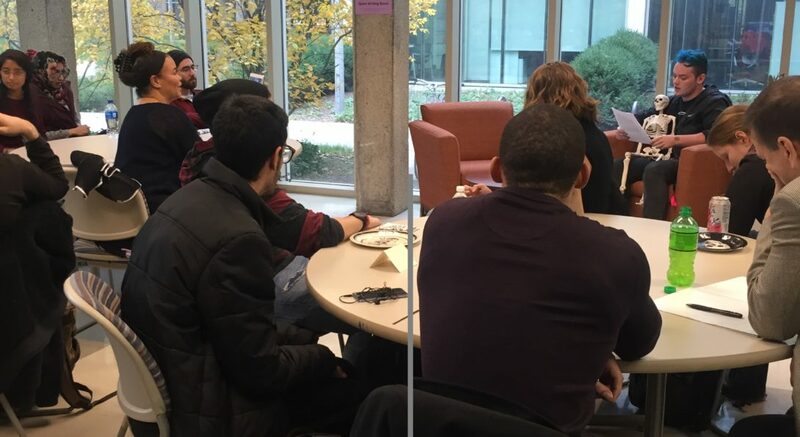 On Oct. 26, Office of Undergraduate Studies in English hosted an open-mic night themed “haunted,” allowing student to orally narrate their short stories, poems, and sometimes formulate a story based on a random topic from the audience. There were various personal topics addressed in each story: police brutality in the Black community, immigration, deportation, law, death, and sexuality, to name a few. The various narrations were powerful and intriguing as the readers did not simply read their stories but included intonations, bringing their stories to life. Indeed, the stories narrated had diverse tones, themes, as well as ideas, but there was more diversity in terms of educational level and major. The participants were not simply just English undergraduate students, but the group also included doctorate degree holders, graduate students in the STEM field, and head of various educational departments. Allison James, program coordinator in the Undergraduate Studies Office, said the English department started the open-mic event intending to create a space in which English majors could share their writings. However, the English Department extended the opportunity to other writers who are non-English majors but love writing and want like to share their work with others. “This creates a space for all writers to come together to hear each other’s work without any critique,” she said. This event created a pleasant environment for all writers to have their voices heard as well as feel safe while sharing their work.